Adventure output on a PDP-10 mainframe. 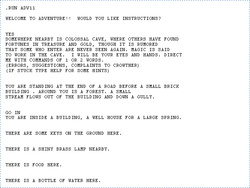 Colossal Cave Adventure, also known simply as Adventure, is a computer-based text adventure game created by Will Crowther in 1976, with a subsequent and better-known version created by Don Woods in 1977; Steven Granade made further updates, including an expanded parser, in 2002. The game's setting is based largely on the Bedquilt section of the Mammoth Cave system in Kentucky, combined with fantasy elements such as elves and magic. In the introduction to his Eamon Dungeon Designer's Manual and elsewhere, Donald Brown notes the similarity of most Eamon adventures to Crowther's game, and cites The Beginners Cave as an example. Brown does the same for The King's Testing Ground in the SwordThrust Manual, and calls all such games "A Class" games in honor of Adventure. Despite the similar setting and the objective of gathering treasure, Adventure's gameplay is very different from Eamon. Players give commands in more normal English-style syntax, and the adventurer possesses no overall hitpoints or statistics. Likewise, though equipped with a sword, there is little to no combat and the bulk of Adventure's challenge is found in complex, riddle-like puzzle situations with frequently abstruse solutions. This style of interactive fiction game, based exclusively on complex puzzles and manipulation of the environment, continued with Infocom's Zork series. Luke Hewitt in an article for the Eamon blog cited Eamon's simpler command system, inclusion of combat and character statistics, and departure from the style of interactive fiction typified by Adventure and its sequels as one of the main attractions of Don Brown's creation.